Small 1-ear Oetiker-style clamps, often used on 3/16" thin-walled liquid tubing. Oetiker clamps provide a permanent clamping solution! 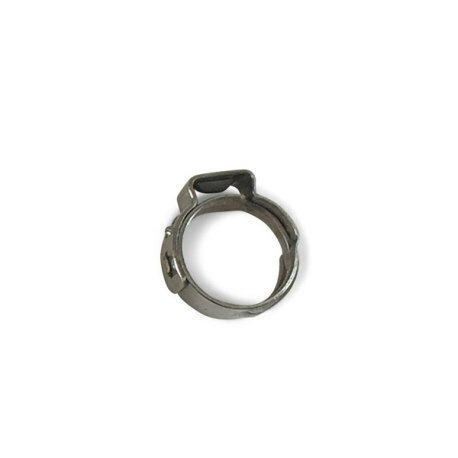 This style of clamp has a 1-ear design, which means they are crimped at a single point on the clamp to create a superior seal over your tubing. These small Oetiker clamps are often used on 3/16" thin-walled tubing that is used in some liquid applications and on thin-walled liquid draft lines. These clamps hold tight, creating a great seal that holds for a long time! Some people prefer these for more permanent systems. If you are looking to switch over to a snug seal that lasts, make sure you use Oetiker clamps!